Bots visit and interact with web pages leading digital marketers to unknowingly include non-human traffic (NHT) in ongoing outreach and customer interactions. Today, bots are experts at looking like human visitors. By detecting and removing non-human traffic from organic and paid data sources, the quality of your marketing efforts - retargeting campaigns, product promotions, A/B testing validation and conversion rates will be more accurate. Website visitor data is highly susceptible to include bot generated data causing product, digital marketing and analytics teams to make misguided business decisions. If the data marketers rely on is corrupted, the outcome will yield wrong results since it is based on skewed data. 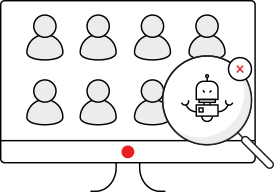 PerimeterX Bot Defender for Analytics differentiates bot-infected data by filtering out bot generated traffic from real human traffic. PerimeterX uses real-time profiling of each visitor through behavioral fingerprinting and machine learning identifying and sharing human and bot traffic with your analytics platform. Pages get a variable mix of traffic from accidental visitors, leads and customers including bots. Bot influenced data will not create the interaction results you need to determine the validity of an online change. It's important to make website decisions based on real human interactions with your website. Testing options based on human traffic will enable you to make the most effective decision to optimize your online presence. PerimeterX Bot Defender Analytics integrates with many analytics tools that provide an inclusive solution for site traffic statistics and conversion rates. With PerimeterX Bot Defender, analytics data is cleaned to remove non-human traffic. The result is a high quality dataset that can be used to understand A/B testing results based on the interaction of humans with your website providing insight into ways to improve online interaction and conversions. Bad bots artificially inflate visits, skew marketing analytics and render your data and ROI inaccurate thereby misleading your decision making. 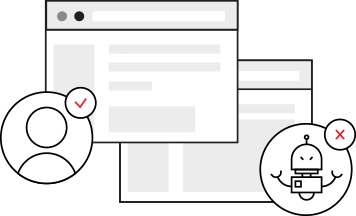 As a marketer you want to know that your marketing dollars are being allocated to target real users and not bots. PerimeterX Bot Defender Analytics uses real-time profiling of website visitors through behavioral fingerprinting and machine learning, sharing the outcome with your analytics platform. PerimeterX is integrated with Adobe Analytics and Google Analytics enabling you to create clean marketing programs without the inclusion of data generated by bots.